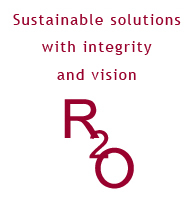 R2O Consultants was established by a team of experienced consultants whose aim was to create a boutique engineering and planning practice which provided high quality professional consultancy services to clients who were seeking the surety and confidence of having highly experienced professionals both managing and working on their projects. With a business focused approach and a staff of highly experienced professionals, R2O Consultants are able to provide innovative, sustainable design solutions that meet our client’s requirements, goals and objectives. At R2O Consultants we treat your project like it's our own.